The Syria talks are beginning today in the Swiss city. The start has been shaky to say the least. The opposition delegation has not come yet. It wants the Syrian regime to stop the bombardment and lift its sieges on a number of towns. The UN just said that it cannot tell who exactly will be present at the beginning of the talks. 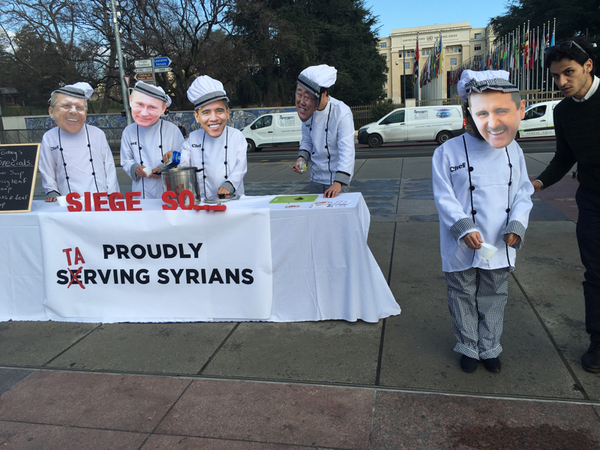 We are being told that the Syrian government delegation is coming today. Just in: The UN envoy to Syria Staffan de Mistura will meet the Syrian government delegation today. Russian foreign ministry says the participation of rebel groups such as Ahrar al-Sham and Jaish el-Islam in the Syria talks is unacceptable. UN spokesperson told us that UN envoy Staffan de Mistura will meet with the government delegation at around 4pm Geneva time. 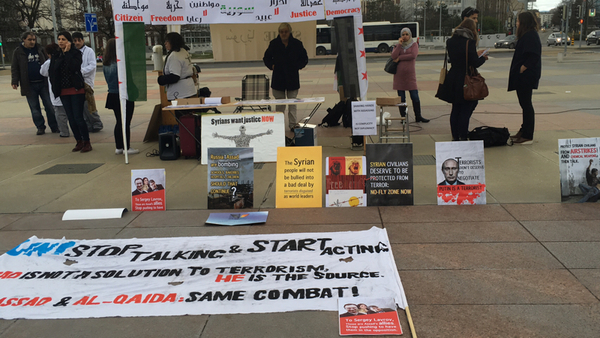 Another sit-in in front of the UN headquarters organised by Syrian women activists. Going to meet former Syrian prime minister Qadri Jamil in a bit. Will keep you posted. The Syrian government envoy to the UN is here. He is in talks with UN envoy de Mistura. Will be waiting for them to leave the meeting room. 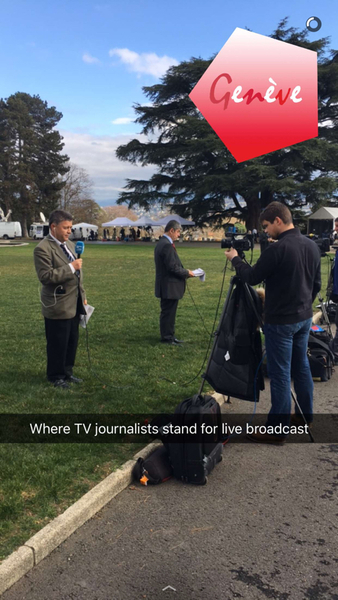 After waiting for him for two hours two hours, Bashar al-Jaafari decided to walk out without speaking to journalists. No journalists at the UN headquarters yet. It's Saturday so everything is a little bit slower. I was told that the opposition delegation will arrive in Geneva this afternoon. All 17 members of the negotiating delegation are coming. They include at least three representatives of the rebel groups. The leader of the most powerful Kurdish party in Syria, Salih Muslim, is in Geneva. He has not been invited by the UN to attend the peace talks. He told me that he wants to be invited and hopes that his movement will be part of the peace process. Russian Deputy Foreign Minister Gennady Gatilov said that there were no preconditions for the Syrian talks and that Moscow welcomed the decision by Syrian opposition coordinator, Riad Hijab, to take part in talks in Geneva. "(United Nations Syria envoy Staffan) de Mistura "has always planned to carry out proxy talks, that is to talk in turns with each delegations: the government and the opposition figures," Gatilov, who is heading to Geneva for talks, said in an interview with Interfax. 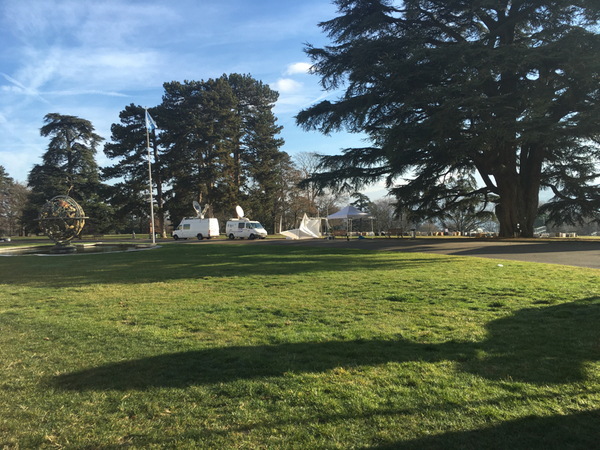 Al Jazeera's diplomatic editor James Bays, reporting from Geneva, said there was a slight delay in the arrival of the opposition delegation, as some members still had to receive their visa to Switzerland. 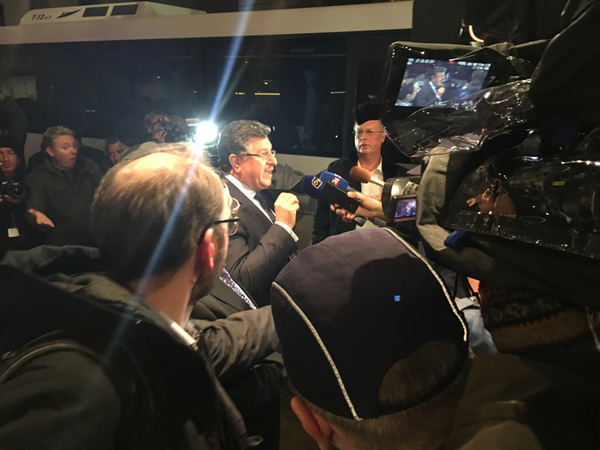 Syrian opposition delegation arrives in Geneva. Informed sources told me that Riyad Hijab, the head of the Higher Negotiations Commission, is not coming to Geneva. It's worth mentioning that he is not the head of the negotiations team (which is different). Hijab is the one who formed the team that is coming to Geneva. Opposition member Monzer Makhos told us that the negotiating delegation team is still stuck in Geneva airport over visa issues. 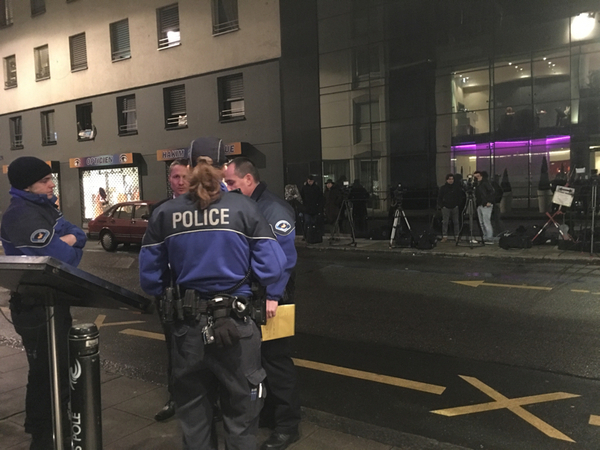 Journalists gathered at the hotel where the opposition delegation will be staying. It's raining! 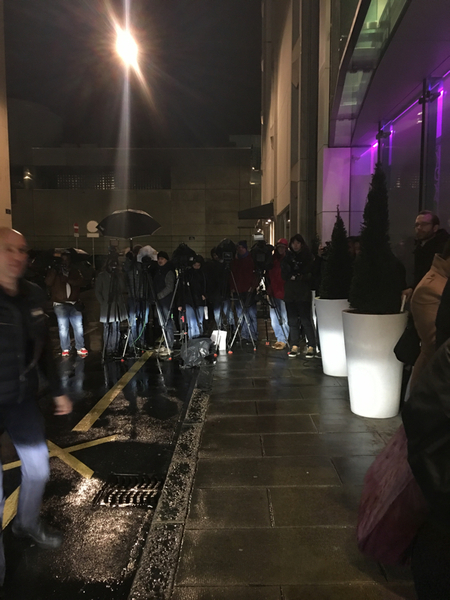 Journalist are still waiting outside the hotel for the opposition who are apparently still at the airport trying to get their visas sorted. Opposition arrived in NVY hotel, finally! The opposition are saying they will meet with UN envoy de Mistura tomorrow (Sunday). "We are here to test the intentions of the regime... We do not have assurances, we have promises". Opposition spokesperson Salem el-Meslet says: "We want the peace talks to work but there is no seriousness on the part of the regime." He cites the bombardment of a displacement camp in Syria today as an example. He says the opposition will discuss with de Mistura their humanitarian demands, including lifting the siege on towns, stopping the shelling and releasing the detainees. "The priority is to lift the suffering of the Syrian people," he says. "If we see an implementation of these demands, including allowing trucks of aid into besieged areas, we will consider this as a sign of good will". Otherwise, the opposition will not go into talks and leave Geneva, he says. There will be a press conference by Salem al Meslet later today at around 12.30pm Geneva time at the President Wilson Hotel. The opposition delegation is also aiming to do a second press conference later in the day after their meeting with de Mistura. I just had a small chat with the US and British envoy who both believe that the opposition is more coherent than ever. The opposition members are currently having a meeting amongst themselves. The opposition have left the hotel to meet with UN envoy Staffan de Mistura. I caught up with Sohair Atassi, a member of the opposition delegation, who said that the delegation is committed to discussing with de Mistura the implementation of their humanitarian demands (lifting the siege on towns, stopping the bombardment, and releasing detainees). She said no talks with the regime before a sign of good will. Bassma Kodmani, an opposition member, told me the delegation received promises from US Secretary of State John Kerry and a number of European politicians that a move will happen on the humanitarian front in Syria. The opposition are demanding that the regime lift the siege on towns Syria, stop the bombardment, and release detainees. 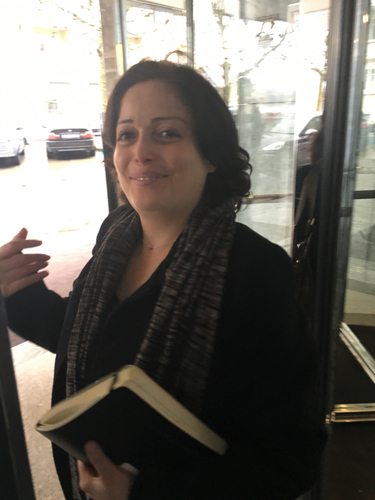 "We do not trust the regime but we are waiting for something to happen any minute," she said. Another opposition member told me he expected the talks to begin on Tuesday, also mentioning serious promises by Kerry. Syrian government chief negotiator Bashar al-Jaafari will give a presser at 1:30pm Geneva time.